Home Uncategorized Can Mi Negra lead to sustained economic growth? Yesterday, I dealt with some of the Social Policy questions raised by Rosales’ proposal to hand out a debit card to millions of poor families in order to distribute oil rents. Today, I want to deal with some of the development economics of the proposal. First off, lets be honest here: Mi Negra is basically about electoral politics, not about development strategy. Given the pressures of the moment, that’s understandable. But the question still bears asking: Can Mi Negra help foster and sustain economic growth? 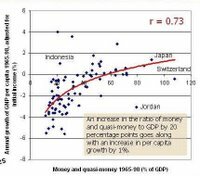 There is good empirical evidence showing that countries that save more and consume less grow more quickly over the long term. As I’ve argued before, this is really a tautology: just a fancy way of saying that, on average, countries that choose to consume less now in order to consume more in the future actually do consume more in the future. So, from a long term growth perspective, the most important question facing Mi Negra is what it will do to Venezuela’s savings and investment rates. If Mi Negra leads to more saving and more investment, it will be a net asset to Venezuela’s long term growth. If the bulk of the money handed out is consumed right away, it will not help the country grow faster in the long term. Now, conventional wisdom has it that poor people in Venezuela can’t afford to save: they’re too economically pressed to favor a little more consumption later over a little less consumption now. Economists would say their “marginal propensity to consume” is very high. Which is neither surprising nor irrational. If I am hungry now, of course I would rather eat 1 arepa today than 1.06 arepas in a year’s time. But the story is more complicated than that. Part of the appeal of Mi Negra is that it would bring a huge mass of new customers into Venezuela’s financial system. If you’re going to issue people a debit card, you will also have to issue them bank accounts to deposit the money they are going to debit. Mi Negra would vastly expand the client base of Venezuela’s banking system. Given that, if clients do nothing, the default option is for money to just accumulate in their accounts, their marginal propensity to consume may be lower under Mi Negra than is usually realized. This is important because a healthy financial system is a key mechanism linking higher savings rates to faster growth. Economists have good evidence to show that financial deepening leads to faster growth. But as some recent research indicates, Venezuela’s financial sector has shrunk along with the rest of the economy in the last 30 years. Today, it’s one of the smallest and weakest in the world relative to the size of the country’s economy. 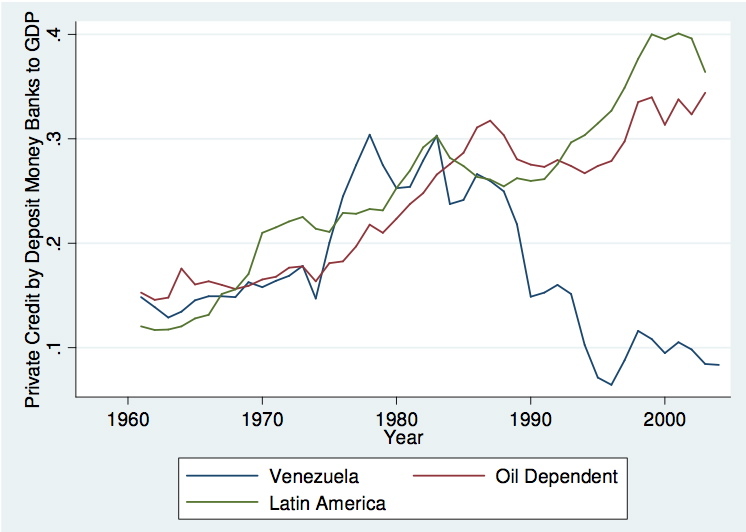 UCLA researcher Matías Braun notes that, in Venezuela, “bank credit to the private sector amounts to just around 9% of GDP, ranking the country in position 132 out of the 157 countries where the figure is available for the 2000s.” If Mi Negra helps to raise that number, it would brighten Venezuela’s long-term growth prospects considerably. So I think the picture is inconclusive. While handing out money to poor people may seem like an odd way of raising saving and investment rates, handing out bank accounts to poor people is an excellent way of doing so. Certainly, it’s a far more promising option than the chavista method, which relies on handing out cash to political supporters without involving the financial sector at all. Some people surrounding Rosales are already busy trying to include some sort of mandatory savings element into “Mi Negra.” From a development strategy standpoint, this is all well and good because, hell, anything that reduces people’s marginal propensity to consume is all well and good from a long term growth perspective. But, of course, any such proposal dilutes Mi Negra’s vote-getting appeal: it’s much harder to pander for votes with some abstract, hard-to-understand pledge that mandatory pension contributions will be made on your behalf than with promises of free money now. Next articleCan Mi Negra lead to sustained economic growth?